Sungyeol may seem like the studious & smart type.But he’s really allof.He has a lot of weak points like whenever he talks, he squeaks and he easily cries. 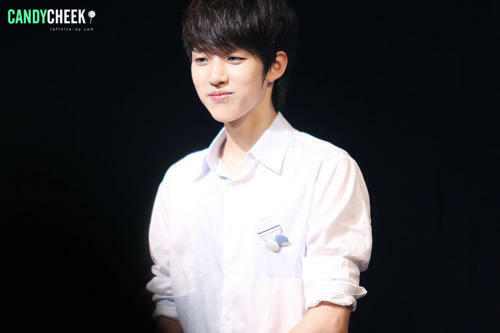 Sungyeol wasn’t a singer, he would become a repeater of the Department of Theater and Film. SeongYeol was in Acting part of SM Academy once before. Sungyeol is the last member who join Infinite. Sungyeol now is working hard to study English. Sungyeol’s precious thing is a letter from a fan.He keeps it in his desk and he’s going to laminate it or hung it to the wall. Sungyeol ideal type: a woman who doesn’t pretend to be innocent & easy going, yet her actions aren’t disliked. Sungyeol had cried at a wedding of a relative whose face he had never seen before.Sungyeol actually cried while looking at the with background for the wedding. Seongyeol begged the hairstylist to dye his hair in green for the BTD. If seongyeol has one last day with her love, he will promise to meet her in the next life. Sungyeol got mad at L because he didn’t want to stratch Yeolie’s back. He felt like dying from the itch.